Over the years I have owned and trained a number of horses. The three that have played a huge part in my life are Romeo, Connor and Rufus. Bought as an unbroken 6yo, Romeo was my horse of a lifetime. 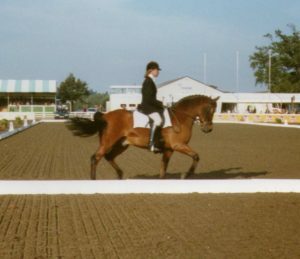 He was only 13.2hh but took me from working as a groom to competing at advanced level. 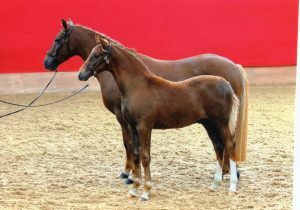 He went to the British Dressage Championships at Stoneleigh in 1997, at Advanced Medium level. Eventually we competed successfully at PSG level and even had a go at Intermediare I . Because he was so small he was always a favourite at the higher level shows, especially when we did the Dressage to Music classes or Gala Evenings. I was heart broken to loose him to colic at the age of 23 yrs. Connor was a 14.2hh Connemara pony who I bought as a two year old. He was a great character, who I never got the better of. He was very talented but only let me tap into about 20% of his talent. 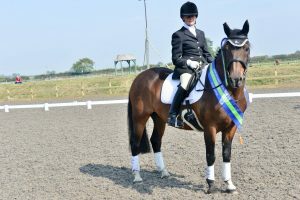 However, he too just about made it to PSG level and in 2014 he won both the Open Medium and the Open Advanced Medium classes at the British Dressage Area Festival at Northalleton. I had to say a sad goodbye to him in 2016 due to a fractured bone in his foot. Rufus is a 13.2 hh New Forest pony. Bred on the open Forest in 2006, he went through the Bealieu Road Sales and then came up to the North East as a weanling. I first saw him as a feral three year old, one of about 20 running out on a fell on the Durham/Northumberland border. I picked him out because he was bay and had a pretty face! I just hoped he would have good legs and feet when I finally got him home. He was very nervous to start with and at times I did not think he would be suited to my job and I even put him out on loan for a year. But fate brought him home when I lost two other ponies in 2016 and he is now competing at Medium dressage level. 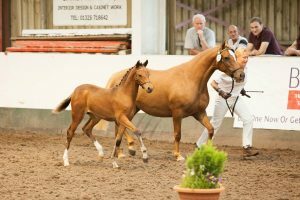 In 2016 he was second in the ‘New Forest Pony Breeding and Cattle Society’ performance competition, also winning the Dressage Trophy and the Best Forest Breed Trophy. Rufus qualified for the 2017 ‘Petplan’ Area Festival Northern Final at Elementary and has continued to improve over 2018 although w have had limited competition outings. How Delightful (Bella) foaled 2011. Sadly she had to be put to sleep in 2016. How Quizzical (Amber) Foaled 2013. Backed and ridden away in 2017 she will hopefully have a career as a dressage pony, either with myself or if I can bear to part with her she will make a fabulous childrens pony. How Imperial (Pipit) Foaled 2015. Pipit is currently stsarting his education. He is lunging sweetly and I have started to lie over him, in preparration to backing him. 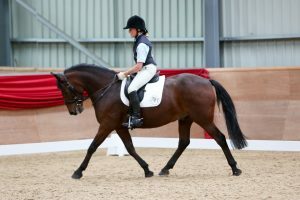 Amber and Pipit are both by the award winning dressage pony stallion ‘Caesar 171’.